After what seemed like a never ending banner ceremony, celebrating what the Rangers fell short of achieving last season, Vigneault and his squad spoiled the party. 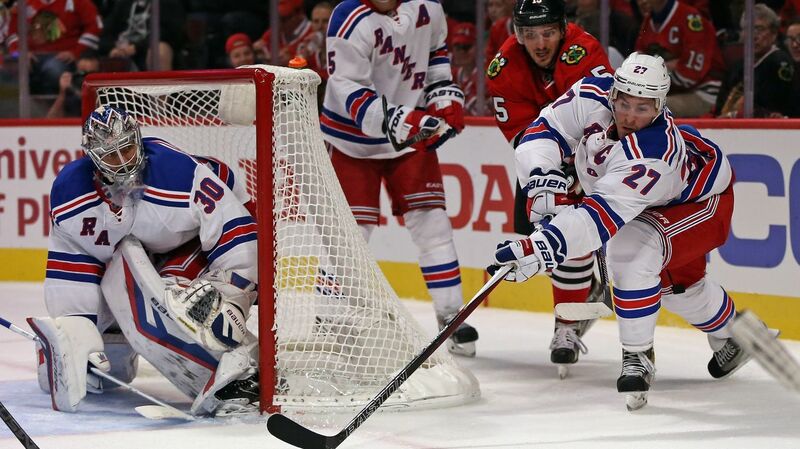 The Rangers came out guns blazing, quickly jumping out to a lead and never looking back, ultimately topping the defending Stanley Cup Champion Chicago Blackhawks by a final score of 3-2. For the most part, this was a very encouraging performance from the new-look Blueshirts, especially from the back end of the lineup. Henrik Lundqvist was excellent between the pipes, the third line was electric throughout the night, and Kevin Hayes fit right in with Stepan and Kreider. New York have been good during the first game of the year, posting a 7-3-1 record in their last 11 season openers dating back to the 2005-06 season. They’ve also won back-to-back road season openers for the first time since 1955-58, when they won three straight. With the win, Alain Vigneault also earned his 99th win with the franchise. He leads all coaches (minimum of 100 games) in points percentage in franchise history (.639). The Rangers were initially delayed from getting on the ice almost 40 minutes due to the banner ceremony running a little past schedule, but it didn’t take them long to score the first goal of the year. And it was from none other than, no not Rick Nash, but rookie Oscar Lindberg. Viktor Stalberg led the rush up the ice, using his speed to back off defenders before dumping it off to JT Miller. His initial pass was block, but he snuck it through a maze of Chicago defenders to Oscar Lindberg for a one timer, and his first goal of his young NHL career. The goal came at just 1:43 into the period, helping to kill the atmosphere early. Lindberg’s goal came on his first shift of the season, his first shot of the game, and the first shot of the Rangers’ season. The period was largely dictated by the Rangers, who seemed to have the better of the chances and scoring opportunities. But Chicago tied the game with less than six minutes remaining in the opening period. After an icing on the Rangers was called off, Chicago quickly transitioned, and Patrick Kane got the puck along the boards. Dan Boyle was way behind on the play, allowing rookie Artemi Panarin a shot from alone in front of the net. He put it away for the first goal of his NHL career. The Rangers made sure to recapture their lead very soon, finding the back of the net less than two minutes after Chicago scored. After Oscar Lindberg drew a penalty, the Rangers got the extra attacker on the ice. JT Miller fed the puck to Keith Yandle at the point, and he faked a shot before passing it over to Kevin Klein for a one timer, putting the Rangers up 2-1. 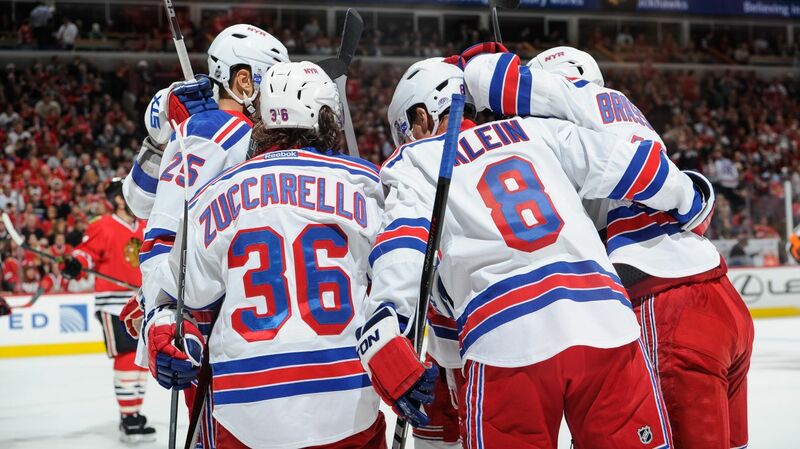 The Rangers celebrate Kevin Klein’s first goal of the season. Photo courtesy of Getty Images. But they weren’t done there, scoring once more with just 59 seconds remaining. Kevin Hayes blocked a shot from Trevor Daley, starting a 2-on-0 with Chris Kreider. Kreider passed it to Hayes, but the shot went wide. However, Daley collided with Crawford, and Hayes was smart enough to chip the puck out to Derek Stepan, who tapped the puck into the empty net. In the second period, Chicago came out with a much more aggressive mentality, pinning the Rangers back in their zone for long stretches of time. They weren’t connecting on outlet passes, and didn’t have as much sustained offensive pressure. Early on, Teuvo Teravainen, the second year winger from Finland, took full advantage of playing on the top line, scoring his first goal of the season. Teravainen found himself uncovered in front of the net, and he snapped home a one timer to cut New York’s lead at one. From this point on, Henrik Lundqvist took over and controlled the game. While the Blackhawks brought continuous pressure and bombarded Hank with shots, he stood tall and made some fantastic saves. His best save came late in the third period, kicking out his right pad to deny Jonathan Toews, who was just feet away from the net. He covered the puck long enough to get a whistle before the puck was knocked over the goal line. Overall, it was a successful first game for the Rangers, especially in a hostile environment against the defending champs. They held a lead for about 56 minutes throughout the night, and defended the lead well, although they need to stop going into a defensive shell at the end of games. The two best lines were the second line and the third line. There was some concern over who would fill Martin St. Louis’ shoes, but Kevin Hayes should do just fine. After a strong rookie campaign, Hayes picked up where he left, picking up a primary assist on Stepan’s goal and playing the playmaker role from the wing. He fit in perfectly, and also won all five of the faceoffs he took. Kreider was electric throughout the night, and I’m very excited to see this line play from now on. The third line could not have had a better debut. First off, way to go Oscar Lindberg! On his first shift of the season in just his second NHL game, following a fantastic training camp, he scores his first career goal and got the Rangers on track early. He almost scored again while trying to deke out Crawford, but Chicago’s netminder was able to kick out the pad and stop it. His linemates also performed very well. 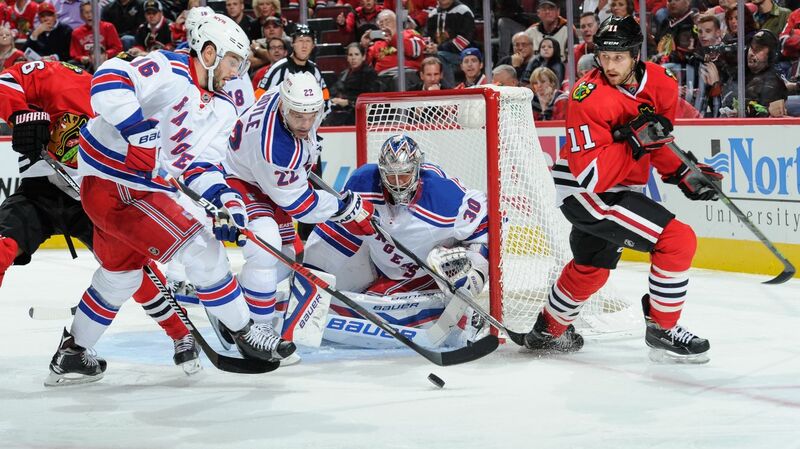 Viktor Stalberg picked up his first point as a Ranger, and was very effective on the forecheck and using his speed. JT Miller was great, tallying two assists and creating chances across all three periods. I doubt AV breaks this line up, and I stick by my prediction of a high 30s-40 point season for Miller. I also thought the fourth line worked well together. Moore played well on the wing, Stoll was solid on the forecheck, Fast complements them nicely, and the defensive play was solid. What’s important though is this; they created offense! There were at least three high quality scoring chances from them, and a near goal from Dominic Moore. I could see Etem coming in for Stoll if Vigneault wants to shake things up. The Rangers next game will be on the road in Columbus, the first game of a home and home before the Rangers make their first appearance at MSG this season. 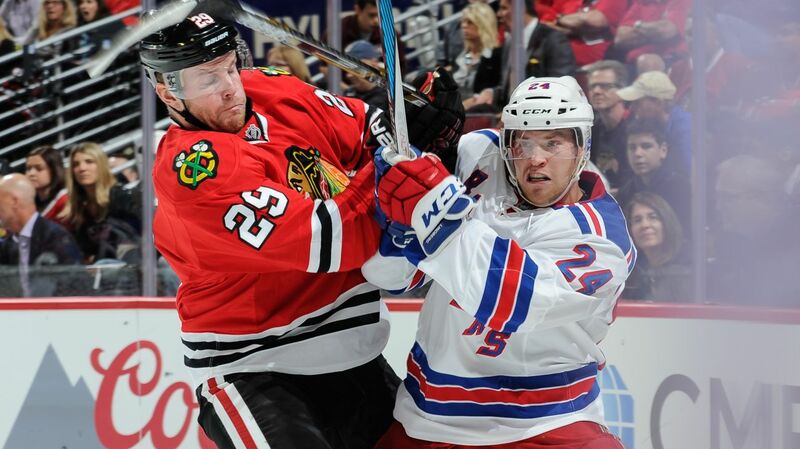 Posted on October 8, 2015, in Game Recaps and tagged Alain Vigneault, Chicago Blackhawks, Chris Kreider, Dan Boyle, Dan Girardi, Derek Stepan, Derick Brassard, Dominic Moore, Dylan McIlrath, Emerson Etem, Jarret Stoll, Jesper Fast, JT Miller, Keith Yandle, Kevin Hayes, Kevin Klein, Lindberg first NHL goal, Madison Square Garden, Marc Staal, Mats Zuccarello, MSG, New York Rangers, New York Rangers blog, New York Rangers roster, NHL, NHL 2015, NHL season opener, NYR, Oscar Lindberg, Oscar Lindberg goal, Patrick Kane, Rangers, Rangers blog, Rangers Season Opener, Rick Nash, Ryan McDonagh, Toews, Viktor Stalberg. Bookmark the permalink. Leave a comment.